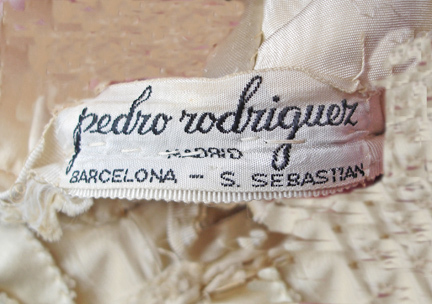 Pedro Rodriguez (1895-1990) Spanish designer credited with introducing "The New Look" to Spain. 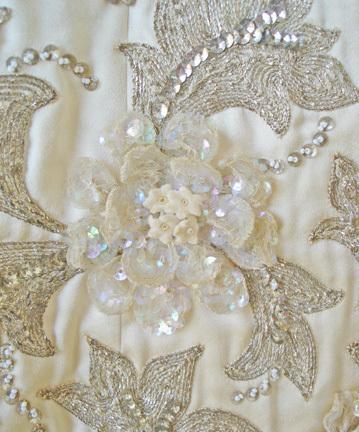 His couture career spanned most of the 20th century. He opened his first haute couture house in Barcelona in 1917 and retired in 1978 at the age of 83. Like his close friend, Balenciaga, Rodriguez favored luxurious textiles and sculptural cuts and his designs and cuts conformed to the very specific standards set by French Couture. His rare custom one-of-a kind couture designs were found in the wardrobes of wealthy Americans who traveled to Spain for his creations. 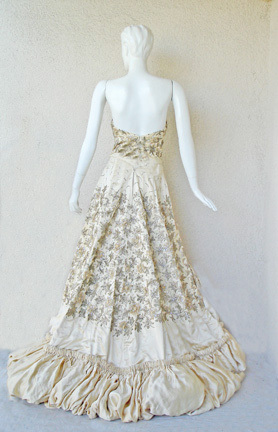 The gown being offered is a rare early 1950's Couture gown designed for American mid century artist Marsha Gayle. 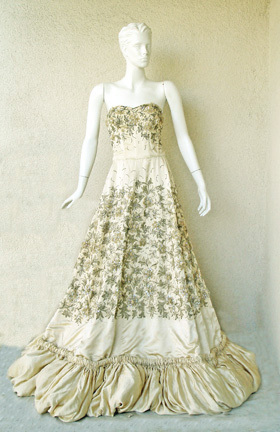 Magnificent and very regal Pedro Rodriguez Haute Couture gown circa early 50's fashioned of champagne heavy silk/satin with exquisite heavily embellished flowers accented by genuine gold thread embroidery in relief by the House of Lesage. 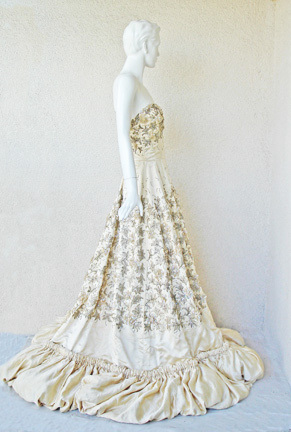 Strapless boned bodice; with cinched waist and full skirt with huge sweep finished with wide ruched border. Back zipper closure.